These are some of the memorabilia items that will be sold during the 47th annual Ernie Blankenship Radio-Telethon on March 27 in Hillsboro. 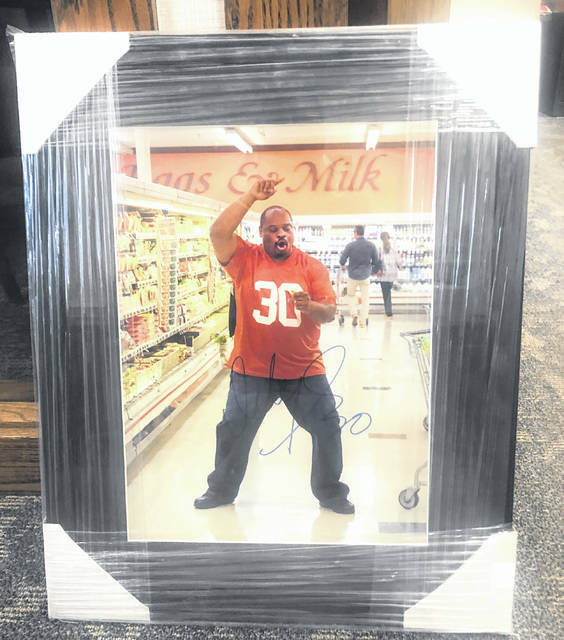 This autographed photo of former Cincinnati Bengals running back Icky Woods will be sold during the radio-telethon in Hillsboro. With the 2019 Ernie Blankenship Radio-Telethon for the benefit of the Highland County Society for Children and Adults less than a week away, event organizers have announced that it will include several auction items that will be sold during the event which runs from 6:30 p.m. until 9 p.m. at the main branch of Merchants National Bank in Hillsboro. In addition to the memorabilia, John Barney and WCHO iHeart Radio are donating six tickets to a Dierks Bentley concert that will be held Friday, March 29 at Nationwide Arena in Columbus. The tickets will be auctioned during the radio-telethon that will be held Wednesday, March 27. The bids will close at 8:50 p.m. Bidders can bid in person at the bank during the event or call 937-393-1993 to place a bid by telephone. 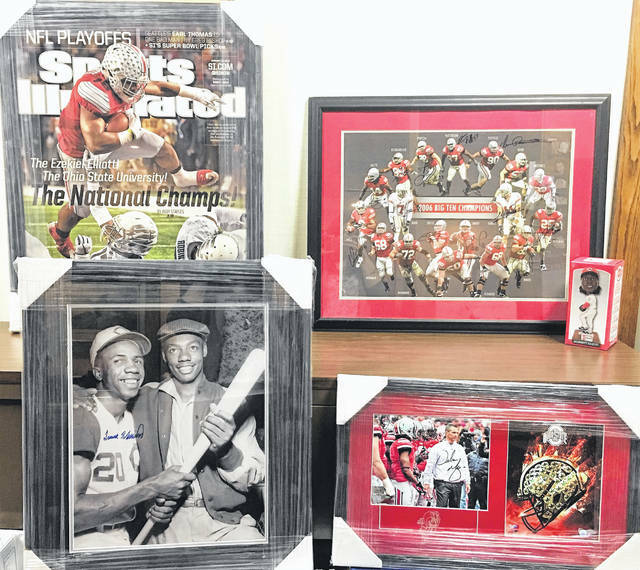 The memorabilia items include: an autographed photograph of former Ohio State football coach Urban Meyer on the sidelines during a game; a photograph of several players on the OSU 2006 Big Ten Conference Championship team, autographed by many of the players; a framed photograph of a Sports Illustrated cover photo of Ohio State’s Ezekiel Elliott from the 2014 national championship game; a Johnny Cueto Cincinnati Reds Bobblehead; and a copy of a photo of former Cincinnati Bengals running back Icky Woods from one of his TV commercials. However, the most collectible item is a black and white photograph of Frank Robinson and Oscar Roberson that is autographed by Robinson, who recently died. Robinson won the National League MVP award in 1961 when the Reds appeared in the World Series. He later won the American League MVP in 1966 playing for the Baltimore Orioles, the same year he won the Triple Crown. Roberson played basketball at the University of Cincinnati and on the 1960 U.S. Olympic team, played 14 years in the NBA, was a 12-time NBA All-Star, won one NBA title, and is a two-time Naismith Memorial Basketball Hall of Fame inductee. Bidders may submit bids in person at the bank or by telephone by calling 937-393-1993. The items will be sold at 8:55 p.m.
“This is a great opportunity for collectors and fans to obtain great sports memorabilia and to help the Hillsboro Rotary Club raise funds for the Highland County Society for Children & Adults,” a news release said. The following businesses that have donated food, advertising or signage for the event: Big Ernie’s Pizza, Larosa’s Pizzeria, Holtfield Station, Ponderosa Steakhouse, Pepsi Cola, Subway – Brad and Melissa Elmore, Community Market, Alley 21, 24 Deli Exchange, Blossoms & Buds, Rick’s TV & Appliance Center, Time Warner, iHeart Radio, Chad Abbott Signs and East Main Flagway.